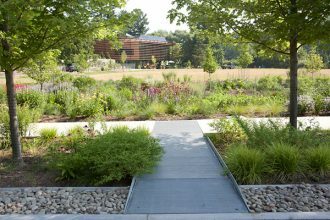 Corning photographer Chris Walters had been taking photos since high school but he never considered pursuing photography professionally. Walters credits Lupi as “a driving force in getting me to exhibit my work publicly.” At her urging, Walters displayed some of his photographs in the arts council’s storefront gallery and they began to sell. His work has now been shown in nearly 30 Finger Lakes area solo or group shows and garnered many honors. Lincoln, his long exposure black and white photo of the Lincoln Memorial, won First Place in a 2016 juried exhibition at the Arts Center of Yates County (see page 29). Walters, 38, has experienced and photographed myriad cultures and diverse landscapes. He’s lived all over the United States and abroad, and has visited 35 countries. Walters was born in Savannah, where his mother’s family has deep roots. His father was a United States Coast Guard pilot and the family moved on average every 2-3 years: Georgia, Alabama, Virginia, Florida, Oregon and Maryland. Walters is one of three brothers and has a twin. When he was in 9th grade and living in Key West, Florida, Walters started taking pictures with his father’s film camera. Aside from a high school darkroom film processing class, he never formally studied photography. In 2002, Walters graduated from the University of West Florida with a BA in Interdisciplinary Humanities and later attended Columbia University, graduating with an MA in International Educational Development. He characterizes the philosophy, religion, English and film courses he took in college as “really illuminating” and helped shape the way he saw the world–both from behind and in front of the camera. In between college degrees Walters actually did begin to see the world, living in the country of Georgia while serving in the Peace Corps as a secondary education volunteer. In 2008, after graduate school, he began working for IREX, an international global development and education non-profit in Washington, DC. It was there that he met his future wife Anne Milazzo from Corning. After they began dating, Walters accepted an overseas IREX position back in Georgia as country director/education programs manager. He oversaw educational exchange programs and supervised a staff of 22. By 2010, the couple was married and Anne worked as an English teacher at the British-Georgian Academy. The couple stayed until 2012, the same year Walters had invested in a professional level Canon DSLR camera and was honing his craft photographing the unique Georgian landscapes and capturing the joy and beauty of its people. The funding for Walters’ position was ending and they were ready to come home and re-connect with their families. The plan was to find work on the East Coast. Walters’ parents were in Savannah and his wife’s parents were in Corning. While the couple initially lived in Corning, they weren’t committed to settling there at first. Anne, a teacher, could work anywhere but Walters wasn’t sure he could find a local job. Then he did. As grants manager and gallery curator at the ARTS Council, Walters appreciates being part of a cultural advocacy organization that enhances the quality of life in the southern Finger Lakes region. He and Anne (“my best friend and greatest encourager”) have enhanced their own lives with the birth of their daughter in 2014 and a son in 2016. Walters can walk to work and loves the friendly, welcoming community of Corning. 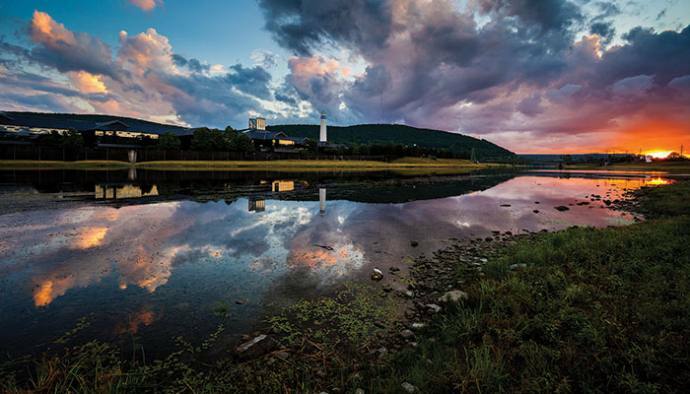 What he finds visually fascinating about Corning are the endless subject matter options, all within close proximity: waterfalls, vineyards, town square, lake, rustic barns, and countryside landscapes. He especially loves the cloud formations in the Chemung River Valley and even the dreary winters. “It’s really a beautiful place to take photographs,” he says. Walters now has a website where he sells his photographs and he continues to show his work at various art venues. Walters was recently selected to exhibit his photographs at the George Waters Gallery in Elmira College as part of the juried, four artist 2018 Biennial Regional Artist Show (March 8 – April 6 ). Elmira College’s media artist Jan Kather, a member of its creative arts faculty, sings high praises of his “lushly composed landscapes.” She touts his artistic accomplishments as well her admiration of his social engagement as a Corning resident who continually contributes to the vitality of the community. Walters is more modest when he sums up his own feelings about transitioning from hobbyist to professional fine art photographer. 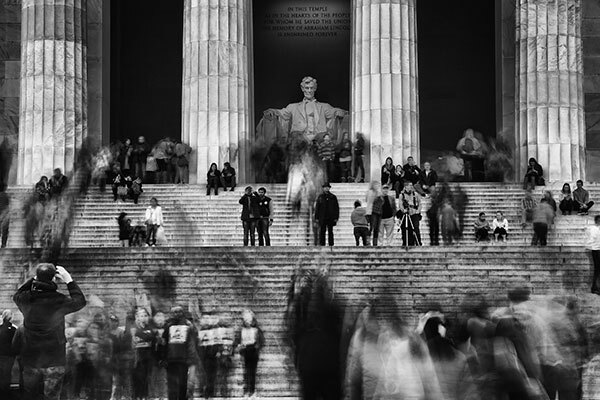 People stand and move in a reflection and stoicism that befits the monument to our greatest president as he watches over everyone with his customary, magnanimous grace. A long exposure photograph is achieved through a simple principle: the longer the shutter speed, the more moving objects begin to blur. The catch, however, is that the longer the shutter speed, the length of time the camera’s shutter opens and closes, the more light enters into your camera. If too much light enters, your photograph becomes a washed out, overexposed scene. To get the correct long exposure with neither too little, nor too much, light you can use a neutral density filter. The filter is a nearly pitch black piece of glass that attaches to the lens and delays the light from entering. I experimented with different shutter speeds ranging from 1 to 10 seconds until settling on 4 seconds to capture people both standing still and moving. I edited the photograph as a RAW file, a digital negative that provides greater flexibility, and used the black and white program Nik Silver Efex 2 because you can make detailed adjustments to how each color will translate into black and white. Lincoln won the Stephen and Elise Rosenfeld Excellence in Photography Award (First Place), in the 2016 Painting and Photography Juried Exhibition at the Arts Center of Yates County in Penn Yan. Visit Chris Walters’ website to learn more and to view and purchase his work.